Over the past 9 months, I have been using electronic versions of the textbooks I have adopted for my classes. My main motivation was to avoid the need to carry a text back and forth between office and home, a nuisance that I resolved in the past by asking the publisher for an additional copy, the cost of which, no doubt, was passed along to students in the form of higher prices. Occasionally, I could borrow a copy from a colleague to keep at home, assuming we used the same text and we were not teaching from it in the same semester. The two main vendors I have experience with so far are CourseSmart and Inkling. CourseSmart has the far greater number of titles available as of now, but Inkling just announced more support from publishers recently as well, so we’re clearly very early in this game. Leasing Leads to Lousy Legibility? Plenty of people have complained about the lack of imagination represented by the CourseSmart approach, essentially shoe-horning all of the trappings of a printed book into a digital form. I agree with many of these complaints, but it is also safe and low-risk, so I don’t fault them for starting here. Where I do have a complaint with the CourseSmart titles, however, is the poor typographical quality. And I don’t mean just in some esoteric, fancy-font-picking sense, I mean the characters in these titles are borderline illegible. It appears that they run each page image through some kind of machine that crappifies the text and introduce a not-so-secret watermark on the page at the same time. Hoping that the version rendered through the iPad app would not suffer from the same crappification, I logged in to my account from there, only to find the same lousy typography. They seem to have found a way to make the iPad look bad, which I didn’t even think was possible when it comes to typography. I’ve copied some sample screen captures from the iPad below for reference. I’m guessing that this DRM layer, and the resulting reduction in quality, is due in part to their business model. Rather than selling a digital copy of the book to a person, they are leasing access to the information on a temporary basis. When a student “buys” a CourseSmart title, they have access to it for 180 or 360 days. The upside of this arrangement is a lower cost than the printed-and-bound version bought new, and the ability to access the book anywhere over the web, including on the iPad and other mobile devices. In most cases, I could most likely find a used copy of the book for the same cost or cheaper and either keep it forever or resell it at the end of the semester. If I knew in advance I didn’t want to keep the book, I could rent it from Chegg or some other textbook rental site for even less. I would have given up the ability to access the electronic book from anywhere, but given the poor legibility of the CourseSmart copy as it stands, so what? While I have been disappointed with CourseSmart books in terms of legibility, their selection is awesome, and their tight integration with textbook publishers pays off. My textbook publisher representative can simply grant access to ‘exam copies’ within CourseSmart and I can look them over wherever I am. This saves an awful lot on receiving unwanted, unrequested textbooks. This pays off for the textbook companies in another way, I’m sure, which is that they can track how thoroughly I’ve reviewed one of their titles. I don’t know for sure whether CourseSmart is providing tracking data back to the publisher, but I’m sure they will soon. It just makes sense to collect this information and use it to improve your sales approach and/or to improve the textbook. 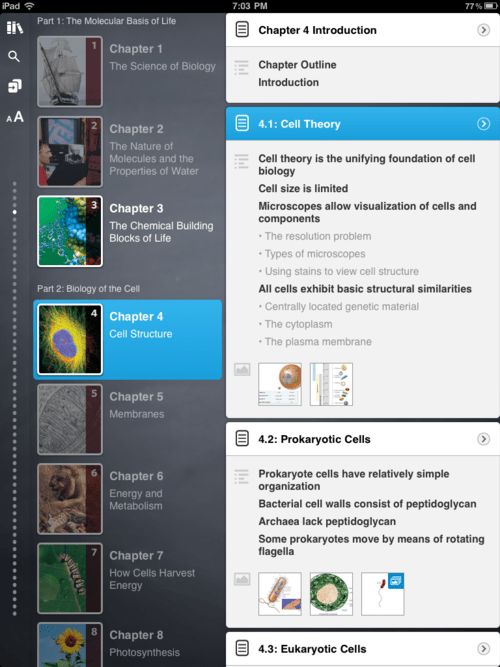 Rather than take the static textbook and copy it over into the digital realm, the folks behind Inkling are trying to re-imagine what a textbook could be. The first improvement over a CourseSmart version to mention is that the text is not degraded, it’s nice and crisp, with selectable sizing and copy-and-paste functionality. This is because it’s real text and not a hyper-processed image of a page. Another huge advantage is the navigation tools for getting around the book. 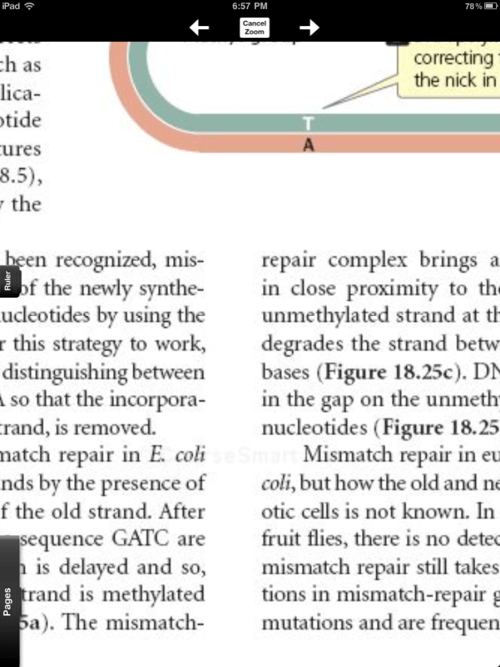 It’s like they’re assuming you might actually want to jump from section to section quickly, say, to refer back to that section about organic functional groups while reading about cell metabolism. This issue of scanning and discovery is always a problem in an electronic document because I always feel like any “page” not visible has disappeared from reality until I summon it back open. I think the navigation tools in an Inkling book do a lot to circumvent this problem for the reader. Add to that the more interactive nature of an Inkling title (at least the Biology volume I’ve used), including definitions for new terms and expandable figures, and it’s clear this publisher has taken an earnest step into the new medium. I think there are at least two reasons why Inkling can provide a higher-quality reading experience. First, they aren’t playing games with their sales. When you buy an Inkling chapter, it’s yours. It lives on your iPad and it doesn’t expire. Chapters cost $2.99, and buying a whole book typically gives a discount over buying the chapters individually. So this is more expensive, but it’s yours. Can you tell I’m not crazy about the rental model? I feel like the Inkling model is a more honest way to sell a book. Secondly, Inkling is providing real text and real graphics that are high-quality, resizable, real. How can they do this? Because an Inkling book is actually something like a book “browser” or reading platform that assembles these parts into a complete experience in real-time. The only place it can live is on an iPad (for now), so the risk of piracy is effectively nil. The major downside so far with Inkling is the dearth of titles and the lack of integration with publishers. By integration, I’m referring to access to complementary exam copies. I’ve personally paid for the Inkling chapters I’ve used so far, which is something I’m not altogether opposed to, but it would be nice to see something more like the CourseSmart model described above. The recent announcement by Inkling (mentioned above) of support from more publishers holds the hope that both of these weaknesses are being addressed. Who knows though, maybe the exam copy issue is not resolvable given the constraints of the Apple app store and the purchase process therein. It may not matter though, because if the quality is good enough, it’s worth paying for. Our Article Got the Cover! The last article I wrote here was about my experiences publishing in science at a liberal arts college. Since getting the article accepted, I’ve completed a couple of rounds of revisions, with a final acceptance in early December. Now I’ve learned that one of our images was selected for the cover of the April 2011 issue! More than anything, I just wanted to note it here for posterity. I’m so grateful I get to work with students I love on interesting research questions. Author Chris WolvertonPosted on March 20, 2011 Categories Research1 Comment on Our Article Got the Cover! I just submitted the revisions on a manuscript that was (tentatively) accepted in Physiologia Plantarum in mid-September. ﻿I’m hopeful the changes I made will make it acceptable to the reviewers and editor. I’m writing this summary today to remind myself what it takes to see a project through from conception to publication here at OWU. I’m publishing it on my blog in case this narrative might be helpful for other biology faculty members at undergraduate institutions. I don’t expect that my experience is normal, or even comparable, but it might nonetheless be helpful to have another data point. As of today, I am a tenured Associate Professor, in my ninth year at OWU. I have not received extramural funding for my research (to be honest, I haven’t even attempted it yet), but I have benefitted from 2 ASPB SURF awards to students. Now that it’s close to complete, it’s a good time to look back at the project and take stock. I started this project in the spring semester of 2006 with my honors tutorial students, Alex Paya and Natalie Janney. I had been thinking about it for several years before then, but we got to work screening for starchless mutant roots (pgm-1) carrying the DR5-GFP reporter gene during that semester. Alex stayed in my lab that summer, along with Liz Calhoun, and he worked almost exclusively on the starchless mutant project throughout the summer. He also returned to the lab several times over the next three years for independent studies, continuing the work he started as a freshman characterizing the growth and gravitropic response of the mutant. During that time, Jonida Toska joined the lab and worked hard on collecting more auxin flux data using the confocal microscope and our DR5-GFP/pgm-1 plants. Both Alex and Jonida are co-authors, along with me, on the paper. To be fair, this is not the only project I have been investing in over the last 4 years. I have had a number of other summer and independent study students over this time, and have been driving 2 other projects unrelated to this one. Hopefully I’ll be able to write about those in the same light as I am this one at some point in the not-too-distant future! We first submitted the manuscript to a journal last summer/fall, and it was not accepted. The general sense of the reviewers was that it needed more data, and one experiment in particular, to be accepted at that journal. We tried to complete the suggested experiment, which involved the creation of a new double mutant, but couldn’t identify a successful cross when we screened the putative offspring last winter. So I decided to rewrite the paper and submit it to a different journal. During that process, I used the first set of reviews to identify weaknesses, and I felt the paper was much better by the time I completed the rewrite, a sense that was confirmed upon receiving the favorable editorial decision in mid-September. Over the last 3 weeks, I made a lot of small-ish changes and improvements in the revision stage, many of which were suggested by the three reviewers. I have to say, the feedback from reviewers was some of the best I’ve ever received on a paper — very balanced, helpful, insightful, and generally positive. They also pointed out some weaknesses that I was able to address in the revision, including the addition of new data I’ve collected over the last 3 weeks. For comparison, our accounting of teaching load in the sciences at OWU is based on ‘contact hours,’ which includes time spent in lectures and labs. We’re asked to maintain an average of 10-12 contact hours. I should note that I taught a new ﻿(to me) class and lab in Fall 09, and 2 new classes in Spring 10. I have also been pretty busy with committee work and university service over this time period, but I don’t want to try to account for that!